What’s on the little island? Storks? I pleaded with this peacock to spread his tail, but he would not cooperate. My camera battery conked out before we saw the giraffes, one of my favorite animals at the zoo. Available as a poster from Electric Lit. 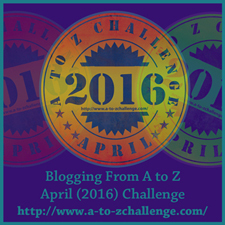 So, I’m guessing a lot of the bloggers participating in the A to Z Challenge will be posting about xylophones today. I’m looking forward to visiting a bunch. The xylophone is a musical instrument consisting of wood bars struck by mallets. It is ancient, at least 1500 years old, and it originated in Africa or possibly southeast Asia; or perhaps developed in multiple locations. One of my favorite pieces of music featuring the xylophone is Fossils, from Camille Saint-Saëns’ Carnival of the Animals. although technically, Brian Jones is playing marimba (which has resonator tubes hanging below the bars to amplify them). If you have not yet had your full of xylophones today, watch the delightful concert below. The ubiquitous hook and loop fastener has hundreds of applications. My favorite use of Velcro is on small children’s sneakers. I bought Velcro shoes for my own five kids (well, maybe not for the oldest; I don’t think they made them then), and as an elementary general music teacher, I spent several hours a week tying shoes of kindergarteners and first graders whose parents were not as forward-thinking as I. Back in the day I also bought nursing bras equipped with Velcro closures. Pro: they can be operated with one hand while holding a hungry baby. Con: the lovely ripping sound they make when detaching guarantees that you can’t surreptitiously breastfeed your baby in public. All eyes will move toward you as curious bystanders try to locate who just tore their clothes. Velcro can be found wherever sewing notions are sold. Hanging things on walls. Artwork, toys, the TV remote, tools, a shopping list pad and a pen, virtually anything that can be organized on a wall can be fastened there with Velcro. Keeping things from sliding. Attach a throw rug to the floor. Attach a chair pad to a seat. Attach a tablecloth to a picnic table. Removing pill balls from sweaters. Closing gaps between button on a blouse. Replacing a worn-out closure on a handbag. Bundling cords. Bundling Christmas lights. Velcro devised a product especially for this purpose. In place of other types of fasteners. A friend who is helping her daughter make slipcovers will use Velcro instead of zippers on the cushions. A friend who was a nurse told me that the invention of Velcro revolutionized the taking of blood pressures. Are you old enough to remember blood pressure cuffs with a row of metal hooks and rows of metal slots? What about you? What is your favorite use of Velcro? Share in the comments below. I love writing with a pen that flows well, and that would be my first choice. However, I grab a pencil if I think I might be making changes. And if it’s a work-in-progress, like a book or a blog post, all bets are off–edits are so much easier on computer. I do the sudoku in the newspaper every morning. They get progressively harder during the week (easiest on Monday, most difficult on Sunday). Many weeks I can’t complete any puzzle after Wednesday. Occasionally I’ll get through a whole week of puzzles, only to get stumped again on Thursday. I kind of like it long. My hair is very straight; I’d just as soon not fuss with it. Lately, my hair has been breaking and I’ve been thinking about going shorter. But my hair was long and straight when I met my husband forty-four years ago, and he definitely prefers it long. List five some of your favorite blogs. Author Linda McQuinn Carlblom’s Parenting With a Smile. My OBT, short for My One Beautiful Thing, posted daily. Treadlemusic, mostly about free-motion quilting. Author K.M. Weiland’ Helping Writers Become Authors. Friday marked the end of an era for us. My husband traded in his 1979 MG Midget for a new Nissan Sentra. When Greg bought it ten years ago, the Midget was his dream car. However, old cars are labor intensive, and we decided not to continually put money into a car that can’t be counted on to start. I am grateful he now has a vehicle that is reliable, and he won’t have to borrow my car on a daily basis. As for the coming week, I have a wonderful life, and I look forward to every day.